@Sachsenhausen | Get Your Grub On! At the end of a long trip I was driving down from Erfurt to Frankfurt with three lovely friends and wanted to show them some local dishes there before we all jumped on other trains and planes to go our own ways. We ended up in Sachsenhausen where I was just a couple of weeks ago with my family and I spotted a place I had been to a couple of times in the past – ‘Lorsbacher Thal’ – another of those famous ebbelwoi (apple cider) places. 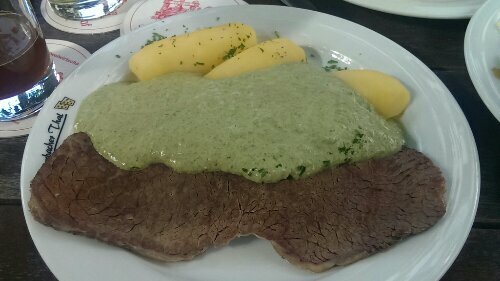 While I was really tempted to order something else I couldn’t other than having the ‘Fleisch mit Grie Soss‘ (meat with green sauce) again. The portions here were ridonculous as the one big slap of cooked beef on the picture is hiding another one right underneath. Tastewise it was also pretty good maybe just a little bit too dry. I really enjoyed their take on the sauce, really refreshing on a summer day like this and plenty of it to drown all my boiled potatoes. Nice place with a small beergarden outside and the guy who served us was overly nice and extremely friendly. Just the meat could’ve been a tad juicier and the kitchen also wasn’t the fastest that I have ever waited for. ‘Lorsacher Tahl’, can. My first stop in Germany was my place of birth, Frankfurt am Main which has a very traditional and regional influenced cuisine to offer. The part of the city where most of the old ‘Ebbelwoi/Apfelwein Wirtschaften’ (apple cider restaurants) are located is Sachsenhausen on the opposite bank of the Main river facing the business district. One of those is ‘Kanonesteppel’ which we chose for today’s lunch. 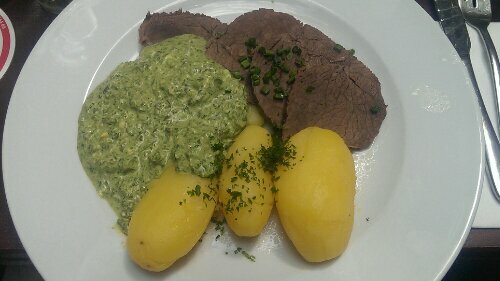 I ordered my favorite Hessian dish ‘Fleisch mit Grie Soss‘ (meat with green sauce) which came with four big slices of boiled beef fillet that was wonderfully tender and lean and fell apart when touched with a lightly sour aftertaste. I really liked the boiled potatoes as they are different to the floury potatoes you mostly get in Asia but these were solid and had a great potatoe-y taste. All this was covered under a layer of this heavenly green sauce mixed together from seven different herbs, sour cream, boiled egg and some other herbs and spices. The sauce was cold and gave the dish a lovely refreshing lightness that I nearly felt sad when I had finished it all up. I normally would have washed that down with the local ‘Ebbelwoi/Apfelwein‘ (apple cider) but I had to drive to Freiburg later that day. Frankfurt is known for it’s fancy bars and clubs but what I almost always do when I’m there is go and visit Sachsenhausen and it’s ebbelwoi restaurants cause I love the local dishes and also recommend them if you want to try some real authentic German (Hessian). I want more.